So you have a WordPress site and you are expecting a spike of traffic to it. Do you know when your site will fall over? How many users can be browsing it at once and still have a good experience? If you can’t answer these questions then you need to load test your site! Through the course of this article I’ll use a new load testing tool by Kernl to test enabling WP Super Cache on Kernl’s blog. Kernl WordPress load testing doesn’t require any coding or load testing experience and by the end you’ll know how to test any performance optimizations of your WordPress site. Plugin & Theme updates for premium products (things that can’t be put in to the WordPress repository due to GPL constraints). 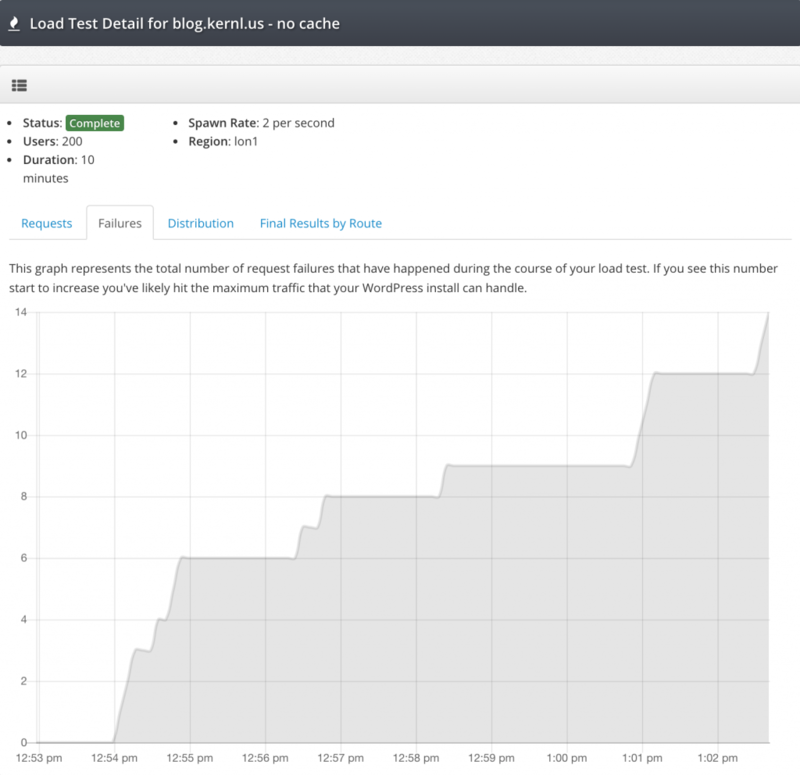 …and now WordPress load testing! 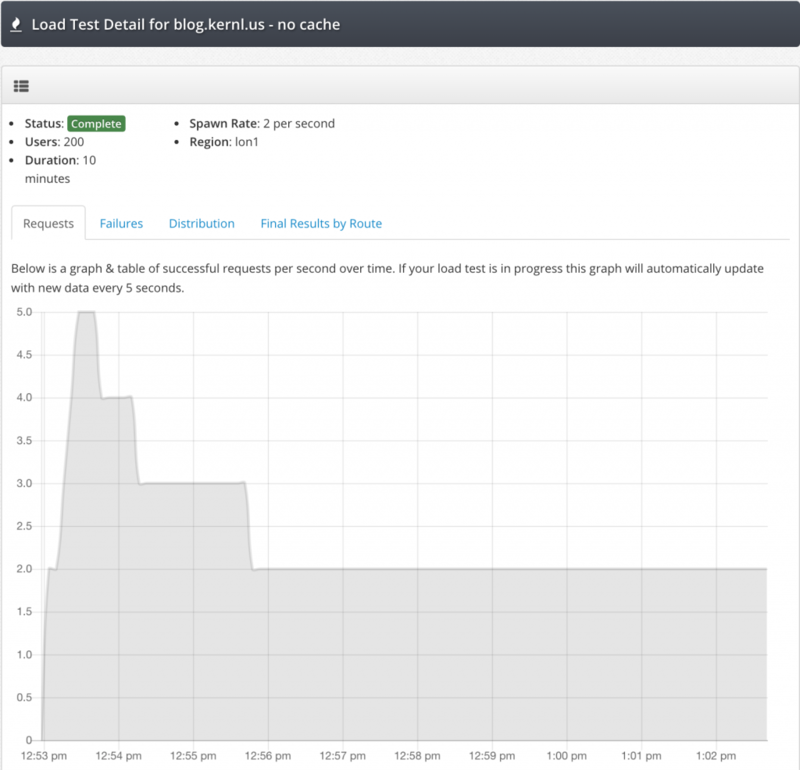 What we’re going to focus on is the WordPress load testing portion of Kernl. 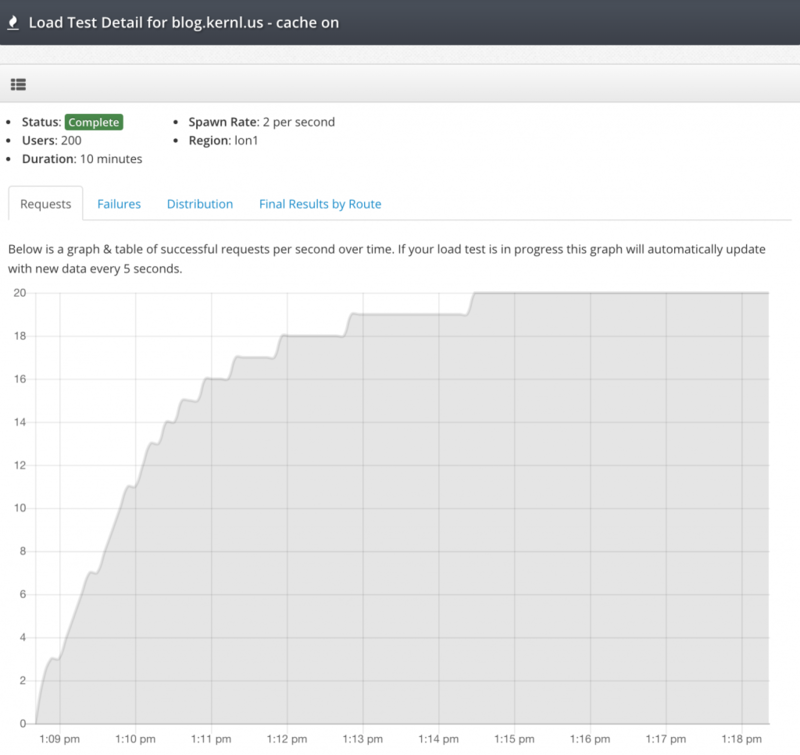 Most WordPress developers never really consider load testing for a number of different reasons. Maybe they think that their site can handle lots of load already or perhaps they don’t know know where to start with load testing. Luckily Kernl can help with both of those problems. So lets get started! The Kernl blog runs on a $5/month Digital Ocean droplet. It has 1GB of RAM and 1 CPU. It runs your typical LAMP setup (Linux, Apache, MySQL, PHP 7). In general this setup is not known to scale well out of the box and requires quite a bit of tweaking to be performant. 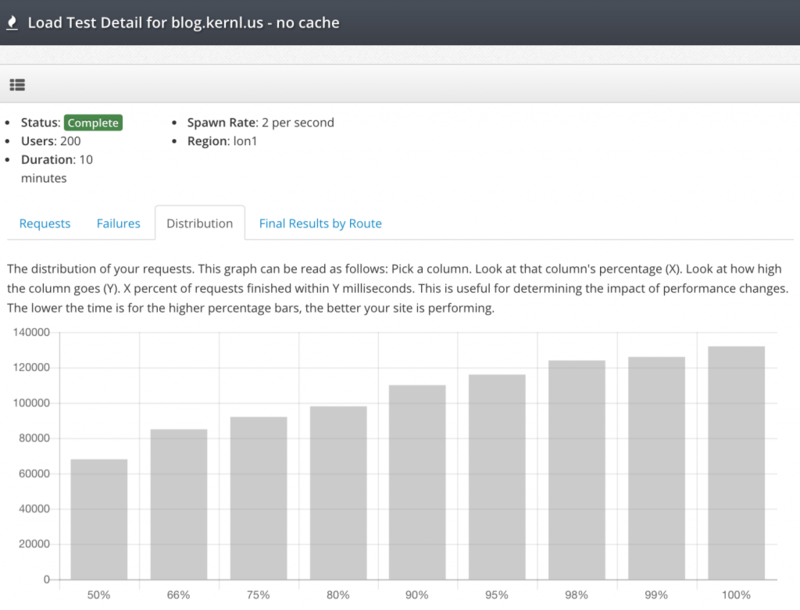 For this blog post though we’re only going to add a caching plugin and see how that changes performance. Create a template – Kernl uses the WP JSON API to fetch your site’s layout. It then creates a load test template that you can tweak based on the data that it fetched. 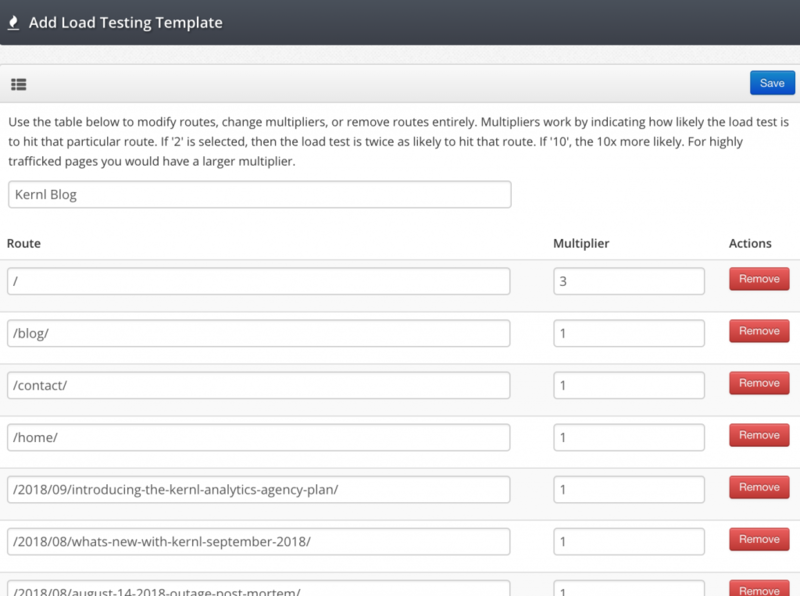 A template simply tells Kernl what routes it should test and also how frequently it should visit a given route. Start a load test – Once you have a template you can start a load test. 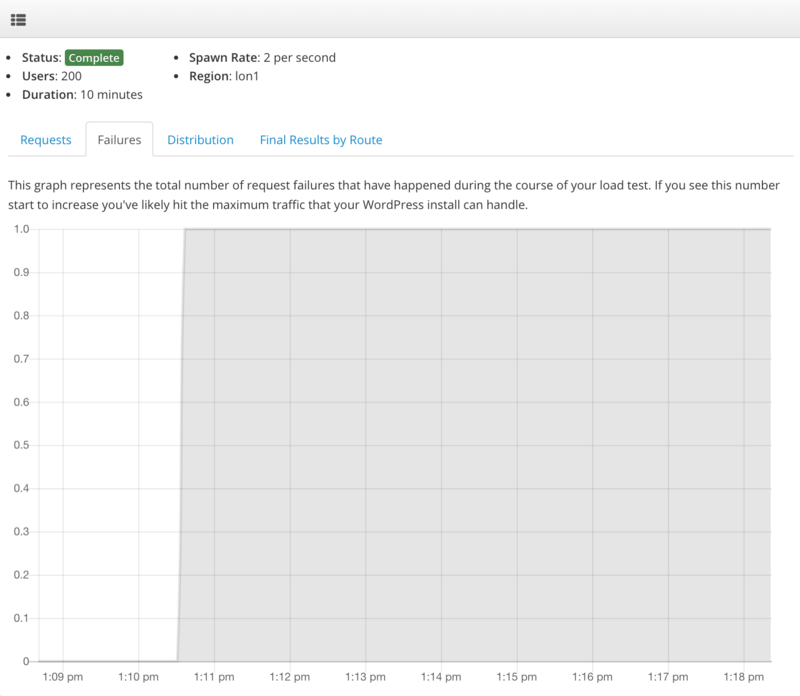 The load test reads the template, spins up the load testing infrastructure, and then reports back the status of the load test. Traffic will be produced from Digital Ocean‘s London data center. Kernl’s blog is hosted in Digital Ocean’s NYC3 (New York City) data center. As you can see its pretty straight forward. Each route it accompanied by a multiplier. The multiplier simply tells the load test software how much traffic it should send to a given route relative to the other routes. So in the example above the “/” route has a 3x multiplier. That means it will receive 3x as much traffic as any of the other 1x routes. For the baseline load test we can see that within 30 seconds or so we hit our peak throughput. After that some portion of the LAMP stack starts to get overwhelmed and can only handle processing 2 requests per second. 2 requests per second is not great performance. You can see from the failure graph that at right around the time the requests graph slows down to 2 requests/s failures start to occur. If you start to see your failure graph climb like this you’ll know that you’ve reached your maximum capacity. The last and most important part of the baseline load test is the request distribution graph. This graph tells us a lot about how users experience our site when it is under load. Pick a column. We’ll use the “90%” column. Now read the value of the column. The value is milliseconds. Combine your knowledge! 90% of requests were completed in 110000 milliseconds (110 seconds). Now that the baseline load test is complete we can enable a caching plugin and see how much better it makes our site perform! For this test we’re using the excellent WP Super Cache plugin. To make sure we were comparing performance in an “apples to apples” manner, we’re going to use the exact same Kernl load test configuration as we did for the first test. WOW! 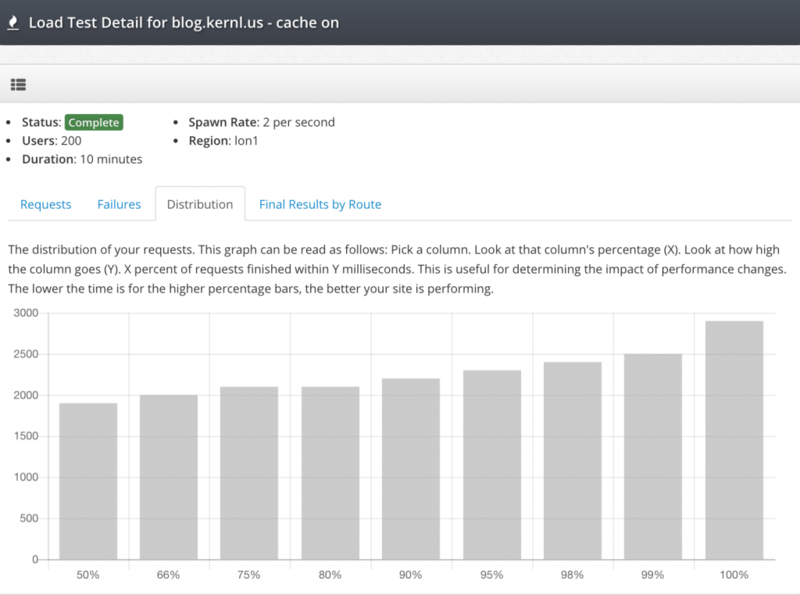 WP Super Cache made a huge difference in the throughput that the Kernl blog could handle. We maxed out at around 20 requests/s sustained which is a 10x improvement over our baseline sustained requests. And what about request failures? Once again, pretty fantastic results. Through the entire load test only a single request failed. To put that number in to perspective a bit: 12,174 requests were made during the 10 minute load test. Only one failed. Thats a failure rate of 0.008%! High throughput and low failures are great, but what about the distribution? If the user has to wait for 20 seconds for the page to load the site may as well be down. Lets check out the graph. This is a $5/month droplet on Digital Ocean. No server tuning was done. No WP Super Cache tuning was done. 20 requests/s is about 1.7 million requests per day. Next time you need to test performance improvements to your WordPress site, be sure to check out Kernl so that you can be confident in your site’s ability to handle traffic. But new features aren’t all that make a service great. For people to trust in something it must be reliable, and thats what the beta phase of Kernl is all about: improving reliability. We’ve reached a point where we feel Kernl provides enough value to the WordPress community to allow us to take some time to refactor code and add a lot more tests. What does this mean for you? Not much. If we do our job right you won’t notice anything. The beta is still free and everyone will get big “heads up” before we start charging for the service. Thank you to all of the alpha users who have made this possible. Without you Kernl wouldn’t be where it is today. One of the problems I’ve always had with WordPress plugin development is doing it in a modern build pipeline. I really wanted to be able to merge a branch into master, build the zip file, and push the update out to my clients. For the longest time I wasn’t able to do this, so I built Kernl to enable a more modern development approach to WordPress plugin development. Continuous Deployment (or Continuous Delivery) is a software development strategy where you ship code frequently. Your pipeline is fully automated, so as soon as some event on your version control repository is triggered the deploy process starts. For me, that event is when I merge a pull request into master. Kernl started out as a way to provide private plugin and theme updates for WordPress, which grew out of my frustration at having to update clients manually every time a small bug was patched. Once I had the updates working manually, the next step was automating everything. This is where “push to build” came in. 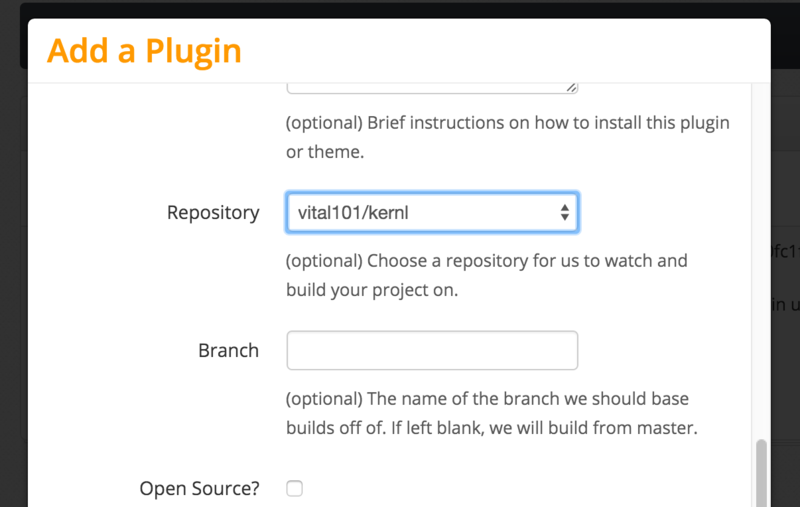 Getting push-to-build updates on your plugin or theme is pretty easy to set up with Kernl. Go to https://kernl.us and sign up. After you’ve logged in, click “Continuous Integration”. Now connect BitBucket. 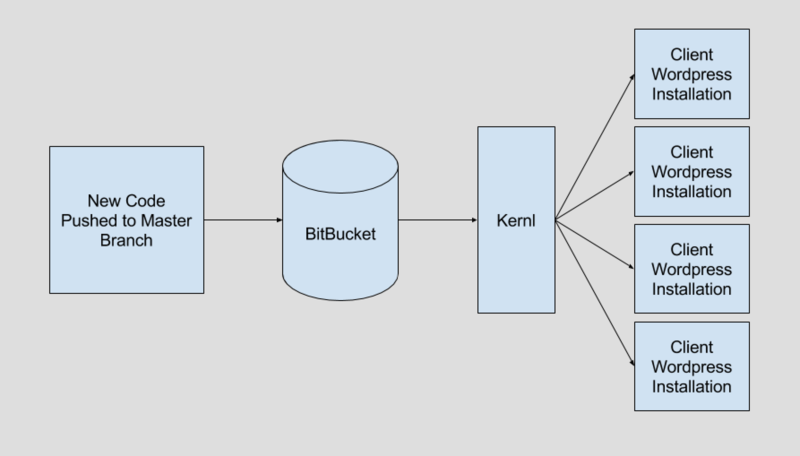 This will authorize Kernl to access your BitBucket account so that it can enable push-to-build functionality. The next step is adding a WebHook to BitBucket. This tells BitBucket to send a message to Kernl after every code push. To do this, go to your repository settings, scroll down to “Integrations” and click “WebHooks”. Set the new Webhook to point at https://kernl.us/api/v1/repositories/bitbucket/webhook. In order for Kernl to know when to build a new version of your plugin, it looks for a file named kernl.version in the root directory of your repository. Go ahead and add this file now and commit it. The kernl.version should contain a semantic version that looks like “1.0.1”. Next, you need to add a plugin. In Kernl, click “Plugins” on the left and then click “Add Plugin” on the upper-right. Fill out the name, slug, and description fields, then scroll to the bottom. You should now be able to select from a list of repositories from your BitBucket account. You can also choose what branch Kernl should make its builds from. The default is master, but it can be anything that you want. Select a repository now and press “Save”. Next, you need to add the first version to Kernl manually. Click the “versions” button for the plugin you just created, and then click “Add Version”. The most important part of the process here is to make sure that the version number in Kernl, kernl.version, and your plugin match. If you put 1.0.0 in the kernl.version file, make sure that it matches in your plugin’s main file, as well as in Kernl when you upload the first version. If this still isn’t clear, check out the example plugin on BitBucket. The kernl.version should contain one line, and on that line will be your version. Once you have the versions figured out, zip up the plugin as if you were going to distribute it and upload it to Kernl. Thats it! Distribute this copy of the plugin to your clients and they’ll receive private updates whenever you upload a new copy or push a new version to your BitBucket repository. With all the boilerplate setup complete, getting a new update out to your clients is super easy. Follow the steps below and you’ll be good to go. Make code changes. Whatever change you want to push out, go ahead and make it. Update your plugin’s version. This is typically in the comment document block in your functions.php file. Update the kernl.version file. This should match your functions.php version. Push to the branch you specified in your plugin setup on Kernl. If you didn’t specify a branch, that means you’ll need to push to master. Done. If all went well, you’ll receive an email from Kernl that lets you know about the new version that was pushed. You can also verify that the plugin was built by visiting Kernl and looking in the version list for your plugin. If you’ve ever wanted to modernize your WordPress development pipeline, I highly suggest you check out Kernl. Automatic updates triggered by changes in your repository will save you tons of time and get bug fixes and updates out to your clients faster. If you’re a plugin or theme developer, there may come a time when you need to execute a long running operation. It doesn’t need to be anything complicated, but something as simple as fetching a Twitter feed can take a significant amount of time. When you come across these types of situations, it’s handy to be able to store the data on your own server and then fetch a new copy of it every X hours. 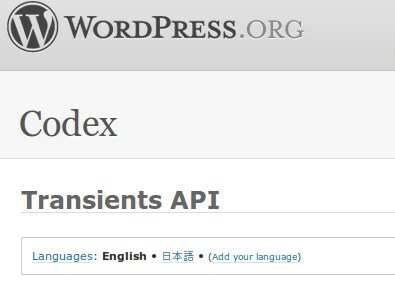 This is called caching, and WordPress convieniently comes packages with an excellent caching API called Transients . If the data exists in the cache and isn’t expired, get it. If the data doesn’t exist in the cache or is expired, perform the necessary actions to get the data. Store the data in the cache if it doesn’t already exist or is expired. Continue from here using data. When attempting to use the Transients API for caching, there are three functions that you need to be aware of: set_transient, get_transient, and delete_transient. set_transient($identifier, $data, $expiration_in_minutes): This function stores your data into the database. The identifier is a string that uniquely identifies your data. Your data can be any sort of complex object, so long as it is serializable. The expiration is how long your want your data to be valid (ex: 12 hours would be 60*60*12). get_transient($identifier): This retrieves your data. If the data doesn’t exist or the expiration time has passed, false is returned. Otherwise, the same data you stored will be returned. delete_transient($identifier): This will delete your data before it’s expiration time. This is handy if you are storing post-dependent data because you can hook it into the save action so that every time you save a post, your cached data is cleared. Now that we’ve covered the basics, how about a quick example? The example is pretty straight forward. We first check to see if there is a cached copy of the data, if not, we fetch the data from the “do_stuff” function, and store it in the database. Simple, right? One of the benefits of using the Transients API (aside from speeding your site up) is that plugins like WP Super Cache or WP Total Cache will auto-magically cache your data into memcached if you have it set up. For you, this means an even faster site! If you have any questions about caching techniques or the Transients API, leave a comment and I’d be happy to help. At my day job I’m really the only person that knows how to write WordPress plugins, so when I write one it’s usually sand-boxed on my machine where nobody can touch it. However, in a side endeavor I’m part of we have a team of 3 people developing on one plugin. As I’m the most experienced plugin developer amongst our team, I was tasked with coming up with a development style and plugin architecture that would work for us. The more difficult aspect of developing this plugin as a team is the sheer size of the plugin. Realistically this could probably be split into about 6 different plugins by functionality, but we want to keep everything together in one tidy package. To illustrate the architecture, I made a quick drawing. The first layer of the plugin is essentially a wrapper. It initializes the ORM that we are using to access the database (we are using a separate database for this plugin’s data), and includes the wrapper class. The wrapper class is where developers drop their sub-plugin include file and instantiate it’s main object. For instance, for each sub plugin there will probably be two classes instantiated in the wrapper. One being admin related functionality, and the other being for front-end display functionality. My thinking with this architecture was that we could all work on separate sub-plugins without crossing paths too frequently. This also allows us to separate the different functionality areas of the plugin in a logical manner. The other benefit to architecting the plugin like this is that it will be very easy to port to a different architecture in the future. I’m well aware that WordPress probably isn’t the best tool for the job, but it is the best tool for the team with the deadline that we have. While thinking about WordPress Plugin Architecture, I cruised the source code of a lot of plugins and it seems that everyone goes about it in a different way. If you’ve ever developed a large-scale plugin with a team, how did you go about doing it? Did you run in to any problems that you didn’t foresee at the beginning of the process? Did you know that PHP has an alternative syntax structure? Up until about two years ago, I didn’t either. It wasn’t until I started poking around in the WordPress core that I saw it. Intrigued, I popped over to PHP.net and read an entry on it. In a nutshell, the alternative syntax can go far in making your PHP code much easier to read. The control structures if, while, for, foreach, and switch can all be expressed in the alternative syntax form. In general, I prefer to use the alternative syntax when mixing PHP in with HTML, and the standard syntax when writing pure PHP. If you’re looking for more resources on PHP’s alternative syntax, check out the documentation here, or the WordPress source code for examples. As a developer of WordPress plugins or themes, you need to be aware of and use data validation. What is data validation you ask? It’s when you make sure that the data you fetched (POST, GET, database call, external source) is the type of data that you expected. For instance, let’s say you have a user enter a number between 1-10. They enter the letter ‘A’. The process of determining whether the input is an integer between 1-10 is data validation. So what kind of data functionality does WordPress (and PHP in general) offer? Lots! intval($value) – This will cast any value as an integer. Particularly useful for casting floating point numbers. wp_kses() – This function will strip a string of any HTML tags that are not allowed. It also makes sure that any HTML entities that are in the string are normal. esc_html($string) – This will escape any HTML characters in a string. This is handy for storing blogs of HTML in a database. urlencode($string) – This function encodes any string you put in to it as a url-safe value. $wpdb->prepare() – This function is used prepare SQL statements for database inserts. I wrote an article about using the WPDB class with your plugin that you should check out. validate_file(..) – This is useful to validate that a file exists, and also to help prevent directory traversal attacks. wp_redirect() – This is the safest was to do redirects. Instead of using header(Location: ..), this will only allow redirects to white listed domains instead domains. balanceTags($string) – If you’re allowing your users to comment on something with html tags, this function will try to make sure that the tags are balanced. is_email($email) – Validates whether an email address is valid or not. As you can see, WordPress (and PHP) include a nice array of data validation functions. Make sure you use them as often as possible, because a large number of web based attacks could be prevented if people validated data.